Does Nothing Come From Nothing? The idea that nothing comes from nothing has held interest for our culture for centuries. It was used in Shakespeare’s ‘King Lear’, the film a Sound of Music, and is still frequently used today in funny comics and signs – often to express the more widely known derivative: “nothing worth having comes easy”. It originated in the work of a 5th century BCE Greek philosopher named Parmenides (founder of the Eleatics school of philosophy, which rejected the validity of sense experience). Parmenides was questioning reality, and in his one surviving poem ‘On Nature’ he explored the difference between our objective and subjective views of what exists. He concluded that because nothing comes from nothing, then in a ‘true’ sense everything has always existed, and nothing can pop into our out of existence. Changes therefore, only run as deep as our perceptions, and thus truly exist in the subjective realm where falsehoods and misinterpretations are widely spread. Generally speaking, most people have accepted this premise that nothing comes from nothing. Indeed the law of the conservation of energy says that the total energy of an isolated system cannot change, and this is a law of science. However some have come to challenge the view, based on a) philosophical reasoning (I’m not going to really address this here as it would make the post too long), and more recently b) on the teachings of quantum mechanics. My position is that these challenges rest solely on a misunderstanding of what the concept of ‘nothing’ really is. The popular, linguistic, and even often philosophical conceptualisations of ‘nothing’ describe it as something which can exist within the dimensions of space and time. If I have no things in my hand, then I have nothing in my hand. No things = Nothing. The popular scientific conceptualisation of nothing goes a little further. For example Lawrence Krauss describes ‘nothing’ as an unstable quantum vacuum with no particles. Hence like the previous description it can exist within space and time. But you couldn’t say that there is nothing in your hand, because there will always be particles there. Based on such a definition Krauss wrote the book ‘A Universe from Nothing’, in which he argued that something can come from nothing. The example used is a quantum vacuum. Sealed off at time 1 with no measurable particles, Krauss said that it would be possible to return to such a vacuum later, and find that there are in fact particles! This argument was used by Krauss as a counter-argument to those who use the apparent contradiction between the idea that nothing can come from nothing, and that the universe began at a finite time, to argue for the necessity of a divine creator. And despite the fact that critics question the validity of his self-proclaimed “proof”, his argument is sound. For in the quantum world space is, as he puts it, a “boiling, bubbling brew of virtual particles that pop into and out of existence on timescales so short, you never see them”. However, the possibility of particles springing into existence within the quantum vacuum is in fact perfectly plausible and logically consistent if the concept of nothing is properly understood. And this is best done with Maths, where nothing is differentiated from zero. If you sit at a table with ten other people, and suddenly realise that you have zero dollars, then you can ask one of the others to lend you some. Does that turn nothing into something? NO, for your sum total is still zero. You gain ten dollars from a friend, which can be spent. But you also gain a liability of ten dollars i.e. you owe your friend ten dollars. So you have + 10 and –10, which together equal zero. Albeit put very simplistically, this is precisely what Krauss is actually describing. Within a quantum field you have zero particles, but also the potential for new positive particles, so long as new negative particles ensure that the sum total remains the same, and thus accords with the law of the conservation of energy. In other words zero speaks of potential. It is quantifiable, and from it you can add and subtract. Nothing is described mathematically as an empty set. It is not quantifiable, and has no potential to be added to, or subtracted from. Thus where we have dimensions such as space and time, nothing cannot exist. It is therefore my contention that nothing does not exist within this universe. What do you think? Can something come from nothing? Does nothing even exist? What is nothing as opposed to something anyway? After all, if as Descartes once said, we know we exist because we think, then thoughts must be real. Yet by that very argument thoughts can’t exist because they don’t think (I don’t actually think this by the way – it would just be one way of interpreting Descartes). And if thoughts don’t exist then how can we? And if we don’t exist then does anything? Maybe there is only nothing as opposed to only everything. What do you think? Can something come from nothing? 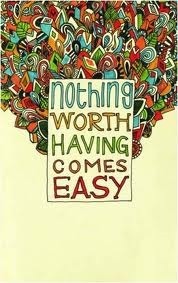 As to the idea that “nothing worth having comes easy”, I don’t think people who use that phrase literally believe it. I think they mean something more akin to “you will be rewarded for your efforts”. Of course the first version sounds more grand (but is a ridiculous thing to believe in my opinion). Thanks for the comment Matt. I think there’s a lot to what you say. But it’s still a different point, and many people do believe that nothing, or at least very little, comes easily. It’s all about what we attribute value to. For instance I remember once being asked what was the most valuable thing in the world. Almost everyone around the table said that it was air, which of course comes to us easily. However think about it. Do we really value air most? We expect it. We don’t even often think about it. Water however, because of its scarcity, is much more highly valued. Indeed the scarcer water becomes, and thus the harder it is to get, the more we attribute value to it. I suppose for the most part it comes down to your outlook on life. For example do you work hard on maintaining good relationships, or do you think they come easily because you enjoy doing the work to build them? But it also depends on whether you agree with Adam Smith or not. He wrote that there are two types of value: one innate i.e. use value, and the other attributed i.e. the value of exchange. If you agree that use value is important then you are likely to argue that you could acquire something with a high value of usage but limited exchange value. If on the other hand you think that all value is the same, but restricted by our ability to exchange, or simply by the laws of supply and demand, which for instance with the example of air say that it is lowly valued because supply is high, then you might agree that nothing worth having comes easily. In other words if it comes easily then you’re not likely to attribute much exchange value to it, because you know that if you use or lose it, it’s easy to acquire another/more.